TrioMarkets – Forex broker. Trading name owned and operated by EDR Financial Ltd, is registered as a Cyprus Investment Firm (CIF) with the registration number (HE336081). Licensed by the Cyprus Securities and Exchange Commission (CySEC license number 268/15) You can open live or/and demo accounts in a few easy steps. TrioMarkets Minimum deposit = $100. TrioMarkets spreads are variable with 5 Digits after the dot quotes. 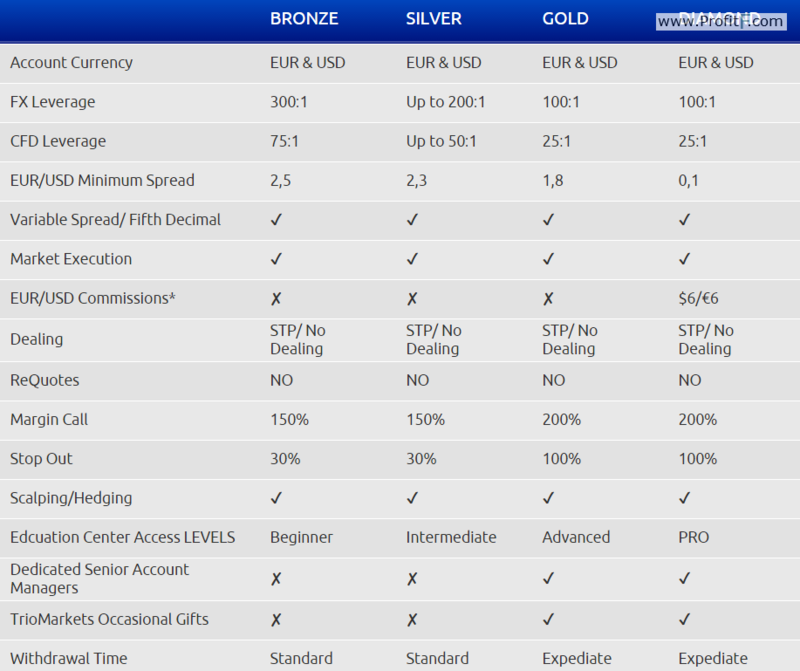 EUR/USD Minimum Spread on BRONZE account 2.5 pips, on DIAMOND account 0.1 pips. (with Commissions on diamond acc. for example EUR/USD $6/€6). TrioMarkets offers Forex Leverage up to 300:1, CFD Leverage Up to to 50:1. Trade can open Account in EUR or USD currency. ProfitF has reviewed the TrioMarkets forex trading platforms. Broker has popular MT4 platform that gives traders the opportunity to trade all forex pairs, The Sirix Web Trader – web based platform allows access to a variety of features directly from the PC. So you don’t need download software before you can start trading. When you want Withdraw Funds, TrioMarkets provides a number of payment options based on your deposit method used to initially fund your account. In the case where Western Union or CashU accounts do not exist, we will arrange a bank to bank wire transfer. The money will go directly to your account. Now, everything seems OK with TrioMarkets broker however “ProfitF team” will keep monitoring this broker and update this review if any changes take place.